What Makes A Good Relay Team And Who Is Ohio's Best? Story lines leading in to track and field meets and headlines following their conclusion often focus on what are considered the 'premier events,' like the 60m dash and the 1600 / 1 Mile contest. And, afterward, if something overly noteworthy didn't go down in those races, conversation can quickly shift to "what about that massive throw" or "did you see that terrific jump?" But what about those hard-working relay squads who consistently leave everything they have on the track, both for themselves but probably more so for their teammates? Plus, not only is watching relay racing arguably as much fun, or more, than any other event, the athletes who make up those teams frequently look like they're enjoying themselves to a degree that surpasses any of the other competitors at a given track and field meet. So what makes the relays so fun? Is it the camaraderie that's established by working together with teammates toward a common goal, is it having the opportunity to compete against a rival club or school or is it taking on the challenge to perform better on your individual leg than you did the last time out? For many relay athletes, the answer would likely be a combination of the three. Mentor's anchor for the 4x800, Nick Kozlowski says it's all about the relationship that he has with his teammates. "When it comes to the relays, we all run for each other." "We try our hardest and we know that our whole team has each other's backs." "That, plus pushing each other to succeed is what really makes the relays fun!" In addition to the 'fun piece,' which is of the utmost importance by the way, what actually makes up a 'good' relay team? Aside from the obvious of having strong runners, of course. Gahanna Lincoln coach, Roger Whitaker indicates that, "it's having belief." "It starts with the belief that all 4 runners will contribute to a run that reaches their goals." Whitaker actually has buzz-words that summarize the make-up of what each leg of a successful relay unit should consist of. The Lions leader insists that for leg 1, "it's about having an 'attitude' and putting a bulls-eye on your opponents back, who resides in the lane to your outside." "For leg 2, it's to 'extend' your lead or catch any front-runners before handing off to leg 3, who must 'maintain'." Whitaker noted that the leg 3 runner can often be perceived as a team's weak link. His advice to combat that label: "take it personally and be a difference maker." He believes that leg 4 must demonstrate 'passion' and 'discipline' and Whitaker's parting shot is, "make it a personal contest between each team's fastest athlete and come out on top!" Whitaker's input should carry a lot of weight, as he was recently named the 2018 NFHS National Track Coach of the Year. While specific philosophies on what qualities a successful relay squad must have will vary, one constant has to be the willingness to embrace the spirit of 'team'. 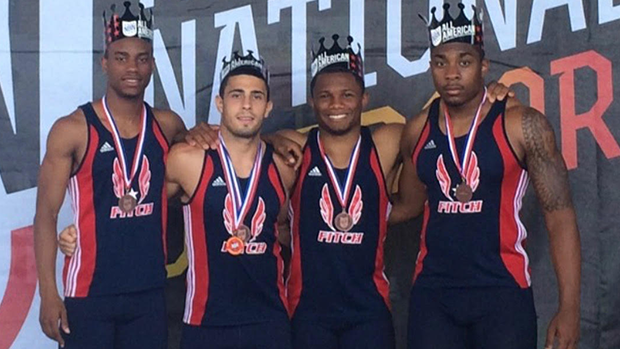 Another highly respected Ohio coach, Seth Steiner of Austintown Fitch, said this: "track and field obviously has both individual and team qualities, but the relays are one of the best "team aspects" in our sport where you are truly relying on a collective group of athletes to all do their jobs in order to be successful." "Finding 4-5 athletes that can develop a true friendship and a strong bond with one another goes a long way." While talking to Steiner about all matters relays-related, among other things, he highlighted the importance that a team must demonstrate "trust" and "consistency" with one another. "The outgoing runner has to trust that his teammate is coming in at his top speed and is flying through the end of the exchange zone." "The incoming runner has to trust that his teammate will leave at the correct time and accelerate through the exchange zone properly." "Teams that are consistent in what they do both at practice and at meets are the ones that tend to perform the best when the pressure is on in the postseason." The 2014 Austintown Fitch Sprint Relays Team. Steiner obviously offers his sage advice from the coaching-front on the sidelines, but his sentiments were echoed by one of Ohio's elite athletes, who often lines-up in the relay events. Evan Matthews states that, "having smooth hand-offs, giving it 100% on your individual leg and having a group who is all willing to do their part are the keys to having a great relay team." And Matthews would know a thing or two about success on the track. The Ohio State bound senior has excelled at whatever he's tried his hand at, including hurdles contests, the high jump and the 400, just to name a few. What about when the unexpected happens in the midst of a relay race? Champions are often defined by their ability to overcome obstacles and by being able to effectively deal with adversity. Coach Rodney Heath of Lakota East put it this way, "strong relay teams need to have speed, discipline and resiliency." Similar to Coach Whitaker, Heath outlines his team's relay approach with key words. "Each leg on a relay team, must have 'speed', as well as the 'discipline' to execute their plan and 'resiliency' to combat unwanted occurrences, such as bumping in exchange zones where protecting the baton is critically important." Keep reading and submit your vote on who has been Ohio's best relay team so far this season!